Protein smoothies are a healthy way to add protein to your diet if you are a vegetarian or vegan or want to increase your protein intake to gain weight or muscle. They provide an abundance of nutrition with little preparation time, which makes them ideal for weekday breakfasts or work lunches. By combining different fruit and protein sources, you can alter the flavor and consistency of your smoothie so that you have a unique and nutritious drink every day. Add soymilk, soy protein powder or silken tofu to your smoothie to increase the protein content. According to United States Department of Agriculture, soy offers the added benefit of decreasing your risk of heart disease because it contains no cholesterol and is low in fat. It makes a great alternative to dairy for those who are allergic to milk or suffer from lactose intolerance. Pour 6 to 8 ounces of unsweetened yogurt into your fruit blend to make it creamier and richer in protein and calcium. The addition of yogurt to your smoothie will also provide you with a dose of probiotics, live bacterial cultures that may aid in digestion and improve your gastrointestinal health, notes Johns Hopkins Medicine. Increase the protein of your smoothie by adding peanut or almond butter or milk. These ingredients provide plenty of protein and are suitable even for vegan diets. Plus, the sweet nutty flavor will complement the fruit in your smoothie. Purchase a pasteurized egg product to add to your fruit smoothie. The University of California San Francisco warns against using raw eggs. Raw eggs may contain salmonella, a leading cause of food-related illness in the U.S. 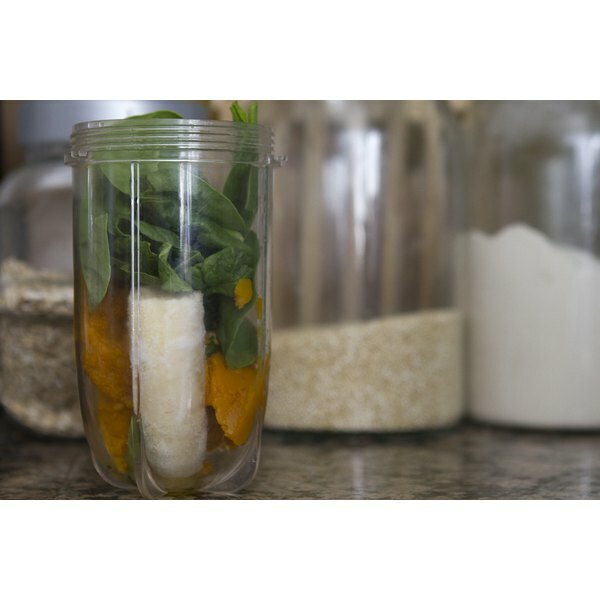 Grind half to 1 cup of uncooked oats in your blender and then drop in your fruit and other ingredients. One cup of oatmeal provides 6 grams of protein, according to the Vegetarian Resource Group. Oatmeal is also high in fiber and many other important nutrients. Mix two tablespoon of whey protein powder into your smoothie and then stir or blend well before drinking. Whey, the protein found in cow's milk, is a good source of protein and amino acids. Do not use whey protein powder if you are allergic to cow's milk.